Looking to drive results for your business? Click here to learn more. Recorded using a Heil Sound PR 30 Large Diaphragm Multipurpose Dynamic Microphone through a Cloud Microphones CL-1 Cloudlifter Mic Activator and a Mackie Onyx Blackjack USB recording interface into Logic Express 9 for the Mac. You can subscribe to Thinks Out Loud in iTunes [iTunes link], the Google Play Store, via our dedicated podcast RSS feed )(or sign up for our free newsletter). You can also download/listen to the podcast here on Thinks using the player at the top of this page. Well hello again everyone and welcome back to Thinks Out Loud, your source for all the digital marketing expertise your business needs. My name is Tim Peter, today is Thursday, January 4, 2018 and this is episode 208 of the big show. Thank you so much for tuning and again I really do appreciate it. I think we’ve got really really great show for you. Just before I took a break for the holidays, I recorded an episode called “Will this be the year of AI in digital marketing?” and I got an email from Dave in Orlando — Hi Dave, thanks for emailing — who is the head of sales for company. And he said that AI might be fine for marketing, and it might be fine especially for digital marketing, but it really doesn’t play a big role in sales. Or he really doesn’t see how it plays a role in sales. Because so much of what he does, so much what his team does is, about relationships. It’s about getting to know customers. It’s about spending time with them, building this really, really great relationship that enables you to close the sale. And, obviously, in B2B, it’s very true that relationships play a huge role in this — and likely will for a long time to come. It’s not terribly likely that we just can, in a really complex B2B type sale, say just go put this in your shopping cart or just let the AI handle it. At least not right away. So, Dave, I agree with you completely on that part. I also think we want to take a step back and talk about what is the threat to you. What is the thing that really might cause you some concern? Because the fact is AI probably isn’t going to steal your job; however, smart people who’re making use of AI and who know how to use AI probably will steal your job and probably will steal your customers. Now I want to take a big step back for a moment before I explain why this is, because there are a lot of moving pieces to this. A few weeks back I did an episode that asked the question “Will AI kill your brand?” I did another episode over a year ago that talk about “Voice, VR, AR, and AI and whether they were hype or hope.” And one of the first things I want people to be aware is AI is real, it exists today, it’s something that people make use of every day. You can make use of it right now. AI is an enormous part of the way Google’s algorithm works and it’s an enormous part of the way YouTube’s algorithm works and it’s an enormous part of the way Facebook’s algorithm works. And if you think that Google and Facebook, for instance are putting a lot of effort into this for no particular reason, I would encourage you to think about that just a little bit differently. Think about all the ways we try to anticipate and analyze and adapt on behalf of our customers every day. Think about how often you do. There’s a lot you need to know about your customer. And a lot of that, a lot of those items that you know really is about data. now you might remember from some past episodes we had one called “why data matters for marketers” and even more importantly the one that was called “AI for marketers: AI makes big data little.” So there are three for four different areas that I can think of off the top of my head where in the sales today — and in marketing and operations and lots of other areas — you rely upon data. For starters, think about lead scoring models: How effective is your lead scoring today? How quickly are you able to adapt that lead scoring to the needs of customers as they change? Do you understand all the inputs? Do you have a good sense of what actually drives people to make a purchase decision or to engage with you as they go forward? Think about your content marketing: When you provide content to a customer — and I want to be really clear about this — if you’re a salesperson and you’re sending an email to a customer, do you know that that email is effective? Do you know that that email works? And when you think about your CRM tools, how do you know when it’s most appropriate to contact the customer? How do you know when it’s the best time to reach them? Or actually get them at the moment of need? Now today we’re relying a lot on data analytics, and when I say today I mean if we look back over the last 10 years or so, there’s been an immense amount of focus around the data and analytics to make your lead scoring work better, to understand how people are engaging with your content, to look at your CRM and see if it is in fact helping drive people down the path. But what we see again and again and again as I go in to work with companies, as people I talk to work with companies, etc. we see this problem of they don’t really have a good sense of what data matters or which touch points played a significant role in terms of moving the customer further down the purchase path. That’s a really, really tough problem to figure out. When I should talk to my customer. When I should reach out to them. And with what message. Now smart salespeople do this really well today. They kind of get it intuitively. But they’re not perfect. We all know that, right? There is not a salesperson out there has a close rate of a hundred percent. And if you have one that does, that salesperson is not charging enough. Fundamentally if everyone says “yes” to your product, you’re probably not pricing it correctly. There’s an opportunity here to understand what’s really working and what’s really helping customers connect with us in a way that says, yeah, this actually solves the problem, this actually helps them make the decision to buy from you. Now that’s where AI is going to play a big role. We’re not suddenly going to turn over sales and marketing operations and everything else to machines. We’re going to have people who understand how to make use of those machines to achieve the right business outcomes, to move people further down the purchase path. To get them to pick up the phone and call you. Or get them to reply to your email. Or get them to text or reach out to one of your salespeople to schedule that next dialogue. And that’s really where the threat — if we can call it that — of AI comes into play for people who are on the sales side or on the operations side. Because worrying about AI instead of seeing it as an opportunity is probably a mistake. When I’m in board rooms talking to C-level folks, they’re all talking about, “what is our company’s AI strategy?” And so the question I have for you is what you is yours? There are tools out there right now. So IBM makes a tool that they called Tone Analyzer that you can test right now. You go out there — I’ll put a link to the show notes — that will allow you to put in a whole bunch of text and it will tell you here’s how people are likely to respond to you, here’s how they are likely to feel after they read that message. If you think about it, that’s a really powerful powerful tool, because it helps us understand, “yes, this is how we can expect our customers to respond when we say something.” Are we going to inspire them? Are we going to cause them fear? Are we going to make them feel more passionate or joyful about how we might be able to help them? Any of those can be really powerful emotions to move a customer closer to sale. Obviously that’s just a demo. But where that gets really interesting is when you take the data that says, “Wow! We saw people open that email. We saw people return that voicemail. We saw people get in touch with us after we left him a message.” And we use that to feed into the AI from all of our salespeople and show, yeah, this is really working — and build that into the CRM — then you’re going to see immense change. And we’re all ready starting to see it. Because Dave is right in his question: AI isn’t going to steal your job, not by itself. That’s not, we’re not there yet. You’re absolutely right. Dave’s question is spot on. 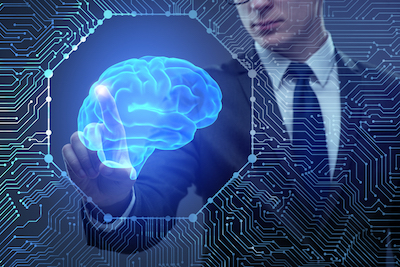 But smart salespeople who know how to use AI to identify prospects and tailor messages to where they are in their buyers journey might steal your job — and frankly probably will. Smart marketers who know how to use AI to make their marketing more effective and more engaging will steal your job. Smart leaders who know how to use AI to identify talent and trends will steal your job. That’s the reality of where we are today. So the reality is AI won’t steal your job; but, smart people who put AI to work will. But only if you let them. Now looking at the clock on the wall, we are out of time for this week. I would like to remind you that you can find the show notes for today’s episode — as well as an archive of all past episodes — by going to TimPeter.com/podcast; again, that’s TimPeter.com/podcast. Just look for episode 208. And while you’re there, you can click on the subscribe link in any of the episodes you find there to have Thinks Out Loud delivered to you in your favorite podcatcher every single week. You can also subscribe in iTunes or the Google Play Music Store or Stitcher Radio or whatever your favorite podcatcher happens to be. Just search for Tim Peter Thinks, Tim Peter Thinks Out Loud, or plain old Thinks Out Loud, we should show up for any of those. And if you can provide a positive rating on iTunes for the Google Play Store while you’re there, I would really really appreciate it. You can also contact me by going to Facebook.com/TimPeterAssociates, on Twitter using the Twitter handle @tcpeter, or just like Dave did, by email by sending an email to podcast@TimPeter.com. Again that is podcast@TimPeter.com. With that I want to say thanks again to him, it is very very much appreciated. I hope you have a great weekend, a great week ahead, and I will look forward to catching up with you here on Thinks Out Loud again next week. Until then, take care everybody.